FluidSolids technologies make it possible to utilise biological waste streams as a source to produce bio-composite materials for consumer goods. Brands can also change their conventional plastic parts to make them biodegradable. How exciting is that?! By replacing traditional, petrol-based polymers with biodegradable FluidSolids composites for any plastic parts, your company’s environmental impact is drastically reduced. Meet them personally at the guided GRV Transparency Tour on Monday the 4th of February at 11.00 am– CSR Hub, Hall A4. FluidSolids is a platform that enables radical implementation of the circular economy and biodegradability by offering sustainable solutions that are both ecological and economical. Additionally, there is a whole new world of business opportunities to be captured using previously unvalued natural resources in form of waste from food production. Every year the amount of residual waste neither used nor recycled rises. As mountains of waste grow, the acceptance to embrace new and radical solutions is on the rise. FluidSolids‘ technology is a game changer, as it uses residues and waste materials from industrial processes to produce biodegradable bio-composites. This contributes to the reduction in global plastic waste while opening future markets and revenues for customers reusing their own industrial waste. Using natural wastes such as nutshells, wood fibers, corn cobs, cardboard, hemp, cotton, spent coffee grounds or paper – to name some – does not compete with valuable and limited agricultural land. FluidSolids uses these residual materials to produce bio-composites. Integration into existing production lines is quick, simple and adds another link to your value-added chain. Production waste and products made of FluidSolids® bio-composites may be used again at the end of their life-cycle – simply add them to virgin materials and reprocess them. Any waste that you don’t add to recycling may be composted or incinerated in an energy-from-waste plant, yielding additional revenue. By implementing the FluidSolids® technology into your production process you are complementing the circular economy by adding an extra cycle that not only save costs but truly improves your operation’s carbon footprint. Bio-composites by FluidSolids® are a sustainable alternative to standard, petroleum-based plastics. They feature outstanding mechanical properties with a minimal environmental impact. The internationally patented bio-composite developed in Switzerland is a cost-effective substitute for countless products that have been produced from petroleum-based plastics to date. FluidSolids® bio-composites have all the typical advantages of composite materials. Their high fiber content gives the material a high flexural strength and an E-modulus of over 9,000 megapascal. This means component wall thickness and weights can be highly optimised and made more efficiently. In comparison with other plastics – whether bio-based or not – the bio-composites from FluidSolids are a cut above the rest in terms of total environmental impact and will become a key factor in the pursuit of your sustainability goals. 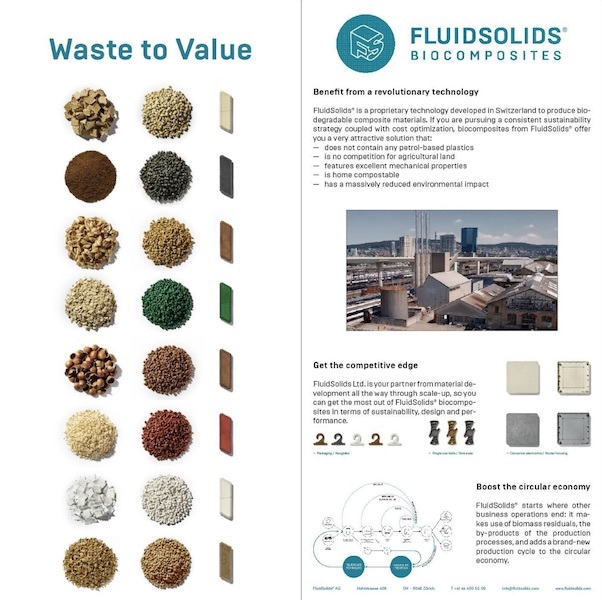 Created in 2011 in Switzerland, FluidSolids® technologies make it possible to utilise your own waste streams as a source to produce bio-composite materials. The company put together a team of chemists, engineers, materials scientists, plastics technologists, designers and controllers to push technology to perfection from workshop floor to board meetings.